I’m not unemployed, I’m self-employed. I’m the owner and artist-in-residence for QUILTArtbymegan. There. I said it. And I’m terrified. Why? Because, even with all the resources and cheerleaders I have, it’s really up to me. I’m the CEO, CFO, and head of marketing. Marketing, ho boy. This means I not only need to promote my work, but myself. That gets difficult sometimes when I fear I’m made up entirely of unrealized potential locked away in self-doubts. This week’s blog post by Les Kertay addresses this problem head-on. It’s good to be scared… and to take the leap anyway. Oh crap, I’m human. Go read the blog post. Really. It’s intensely vulnerable and inspiring all at once. I had a chance to talk with an amazing business woman in last November. She took her art from painting in her home studio to being wildly successful internationally. She spent some time to mentor me, tell me some things that helped her get where she is. As a shy artist who preferred to work alone, as so many of us introverted emotional artistic types are, she has a trick for marketing her work. She pretends that she’s selling someone else’s awesome stuff. I’ve been thinking about that a lot recently and think it’s a great tool to get out of my own way. So, in that spirit, here’s some of the cool stuff that’s available to you from QUILTArtbymegan and its amazing artist-in-residence. Portrait quilts are unique, beautiful, fiber heirlooms. They’re great to celebrate any occasion, including memorializing the death of a loved one. This piece was a gift to someone who had recently lost her companion. 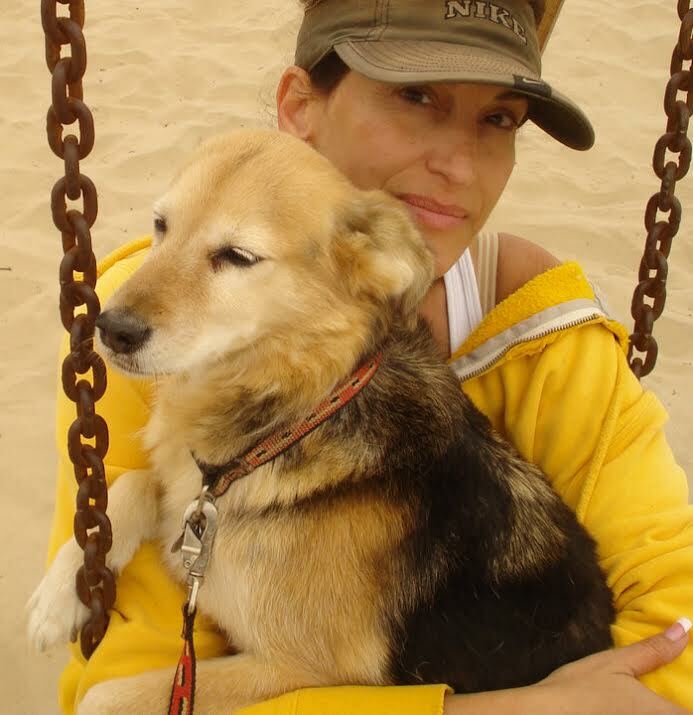 Anyone who has ever loved a pet can understand the effect that their passing can have… especially since they were a part of your daily life for so long. This is a great way to honor that connection. Here’s the photograph that inspired the piece. Here’s the 12×12 art inspired by the above photograph. My customer asked for a top only, not a quilted piece so she could make this into a pillow. 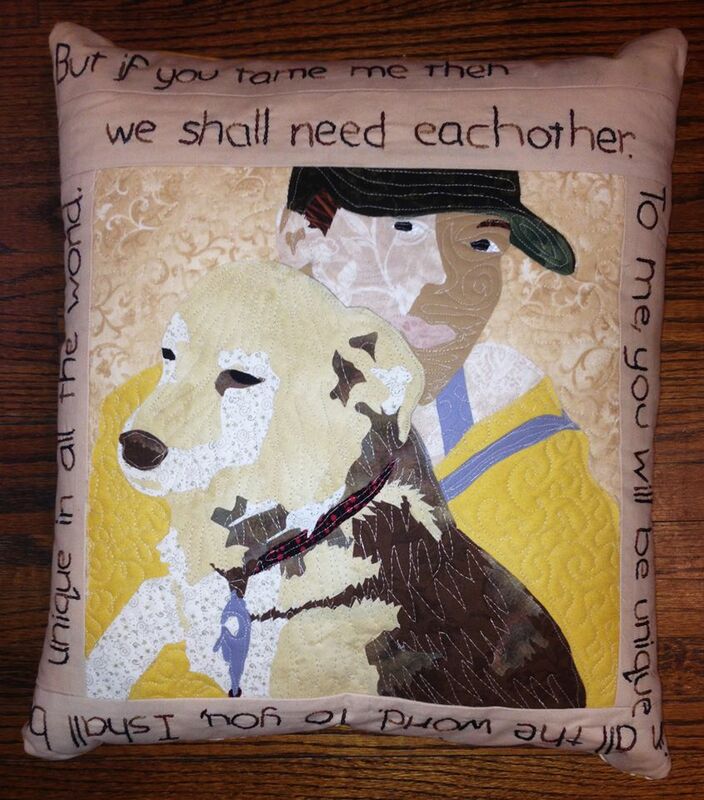 Here’s the final product, after it was given to the woman in the photograph, who’s mourning her friend. I’m so honored to be a part of this memory piece. The embroidery around the edges is from the book “The Little Prince” by Antoine de Saint-Exupery and reads, “But if you tame me then we shall need each other… to me, you will be unique in all the world,.. to you, I shall be unique in all the world.” My customer also did the beautiful quilting before making the piece into a pillow. I am working out the details for another memory piece. This time, it’s a T-shirt quilt. The shirts are team shirts from college, which will be turned into a bed quilt. I enjoy every project but these memory pieces are extra-special to me. This entry was posted in Art, Artist's Studio, Collaborations, Custom Work, Inspiration, The Business and tagged believe in yourself, business advice, business owner, celebrations, dog quilt, fiber heirlooms, K.C. 's pillow, leap, Les Kertay, losing a pet, marketing, memory quilt, portrait quilts, rainbow bridge, self-doubt, self-employed, selling art, small business, T-shirt quilt, take the leap, team shirts on April 19, 2014 by quiltartbymegan. Here are a few of the treasures I’ve been working on. The first is a wedding quilt for a dear friend. Spoiler alert! It’s green. 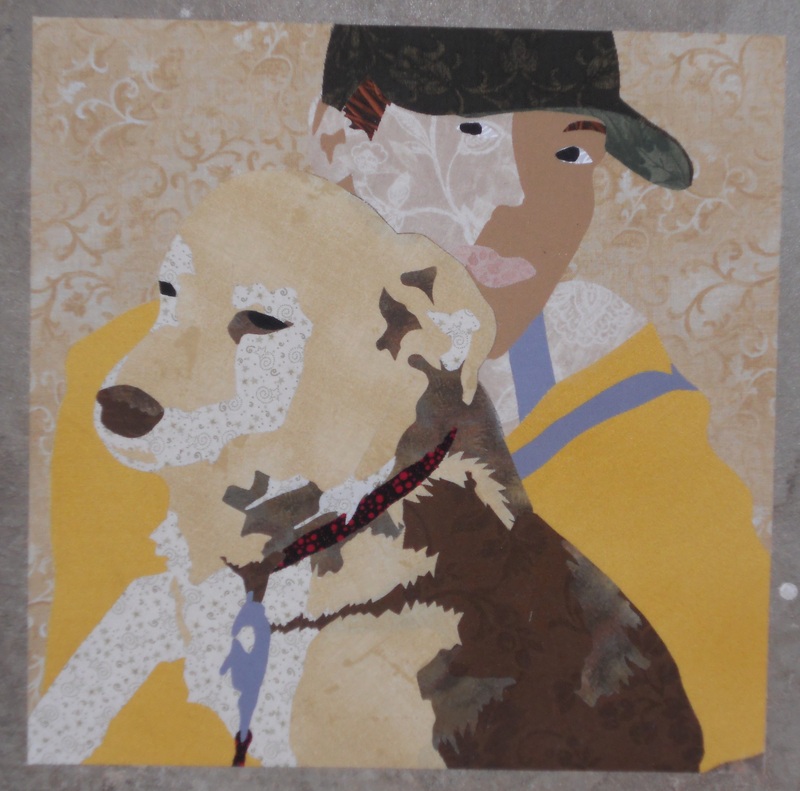 I wasn’t able to go out and get this tracing for a portrait quilt of a dog enlarged today. So I pulled some fabrics for it instead! Here’s my method of keeping everything straight once I’ve made the decisions. FYI: I’ve put 90 minutes into this quilt already and haven’t yet started putting it together. That’s why I charge $25 per subject as a design fee! I finished this quilt. Woo! It feel so good to have a project done done done. This is a signature quilt and is for sale in my etsy shop. 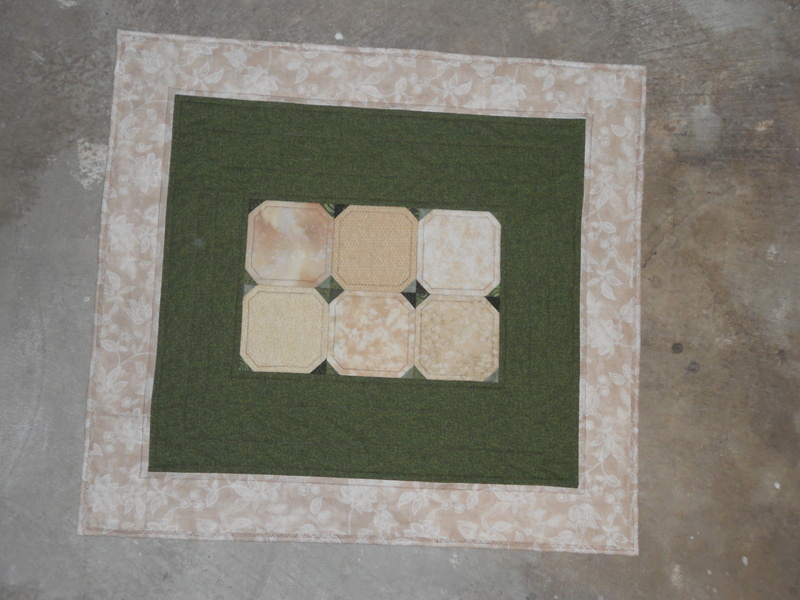 You can sign this quilt in the beige fabric spots… which, as you can see, make up most of the quilt. It’s great for weddings, anniversaries, birthdays, and other celebrations. Super-durable, it’ll hold up to washings. 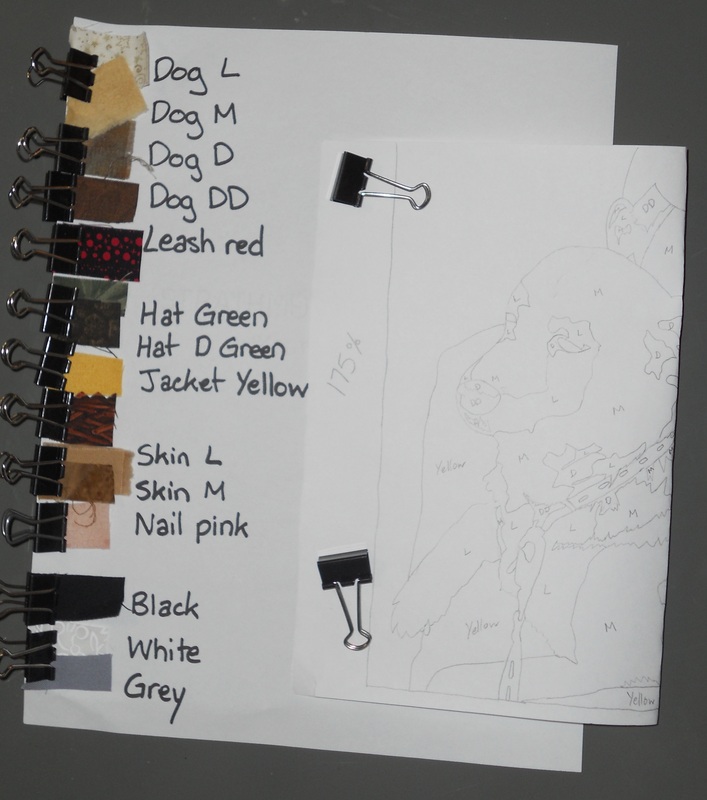 Just make sure to follow the directions on whatever fabric marker you buy. Some of them need to be set with a hot iron. 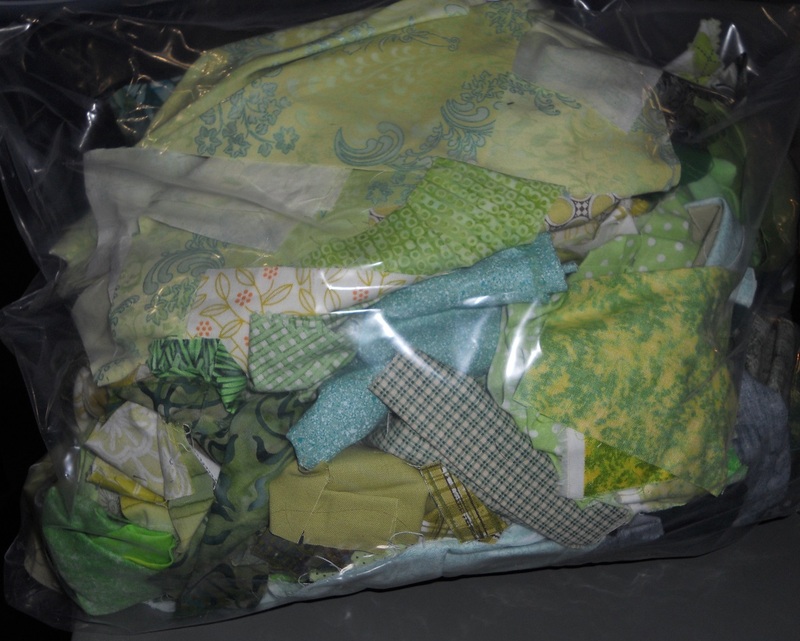 I’ve also been working on this week’s Project Quilting Challenge, which is up-cycling. I pulled some fabric for my new guild’s round robin. I’ll be adding a border and some embroidery. Unfortunately, this is all supposed to be secret until the big reveal in a few months so I cannot share photos of it until then. This entry was posted in Applique, Art, Artist's Studio, Custom Work, Paper Piecing, Portrait Art Quilts, Quilt Guild, Quilting the Quilt, Signature Quilts and tagged a finish, anniversary, baby quilt, baby shower, choosing fabrics, design fee, dog quilt, done, fabric pens, finish, green wedding quilt, party, pet portrait, portrait quilt, project quilting, pulling fabrics, quilt, quilt guild, quilter, quilting, quilts, round robin, signature quilt, tracing, upcycling, wedding on January 22, 2014 by quiltartbymegan.